GAHHHH I WROTE THIS WHOLE POST ALREADY BUT I ACCIDENTALLY CLOSED IT! So, what do you think? I wish I could've gotten a blue-er wig, but I couldn't find any that appealed to me (and that were within my price-range) So I went with periwinkle. I'm gonna get something different for the piercing (a bead and some fake eye-lash glue) or maybe at the last minute, Spirit gum. I heard it works really well. Wish I had a picture of my other friends who were cosplaying as Itachi and Deidara. I respect all critisism, but I don't accept plain out rudeness. 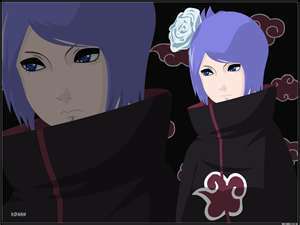 I think the color of your wig matches quite well with Konan's. Very well done! That's an amazing cosplay! I don't think the fabric you used was the best, it looks too modern-y. I would use light (or heavier, really depends) rayon or cotton to make the robe. Traditionally, it should have been silk or satin, but that is WAY too expensive to use. EDIT: I also love your facial expressions! ^^ meh, I bought the cloak. Also, I have no clue what it's made out of. Ive always wanted to cosplay. "No way!! That is just plain epic! It completely looks like Konan!" If they ever make a Naruto movie using people, they should take you! why this was very well the wig perfectly matches well done. 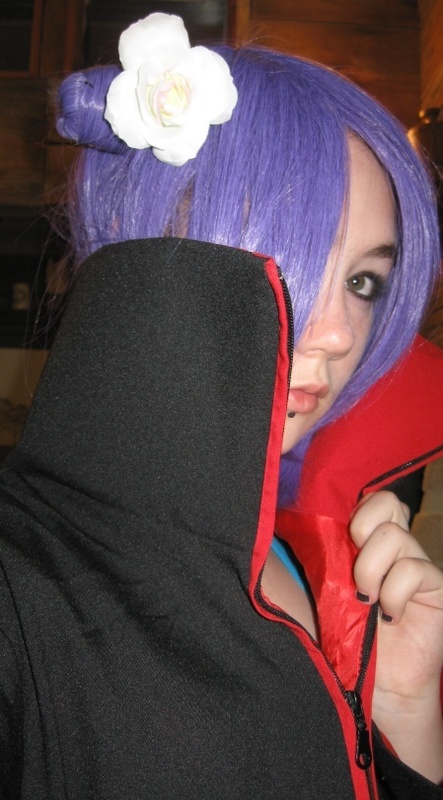 Awesome cosplay, I love Konan. No I bought the cloak at Matsuri, a Japanese festival held near my town every year. And the wig I bought from eCrater. (NOT ADVERTISING) Both for reasonable prices. Cloak; 45 dollars, no tax. Wig: 31.99 free shipping and handling to US mainlands.